Dr. Abdullah Azzam has been seen as the father of global jihad both by analysts and indeed al-Qaeda itself. Al-Qaeda and Jihadis of all varieties claim him to be their founding father. What is interesting is that Azzam did not view those who al-Qaeda viewed as its enemies in the same light. One such figure is the Afghan commander Ahmed Shah Massoud. According to the likes of Western journalist Peter Bergen, Massoud is arguably the most “brilliant military strategist of the twentieth century, surviving six major Soviet operations”. The journalist found him to have an intense “charisma and integrity”. He described him as a “fundamentalist” leavened by an interest in the arts, poetry, sufism an openness towards other cultures- the very opposite of Osama Bin Laden. This impression that Massoud made on Bergen is not unique. This is something that this author whilst researching Abdullah Anas’ To The Mountains: My Life in Jihad from Algeria to Afghanistan (Hurst) 2019 have found not just in western accounts of him but also in Muslim accounts. In fact, the father of global jihad himself, Abdullah Azzam was enamoured with Massoud. And yet in the foundational myth of al-Qaeda, Massoud has often been portrayed as a traitor and an enemy of Islam, someone worthy of killing. This is something they succeeded in doing. It is important to shatter some of these myths for historical accuracy. Below is a translated extract of Abdullah Azzam’s book: ‘A Month Amongst the Titans of the North’. It is an account of his visit to the Panshir valley, Northern Afghanistan, where he met Ahmed Shah Massoud and others. The book allegedly could not get published in Peshawar in 1989 because of the opposition of one of Massoud’s rivals, Gulbudin Hekmatyar, and have remained largely ignored. Yet this account certainly will help to clarify many misconception regarding Abdullah Azzam, Massoud, al-Qaeda and the rise of global jihad movement. 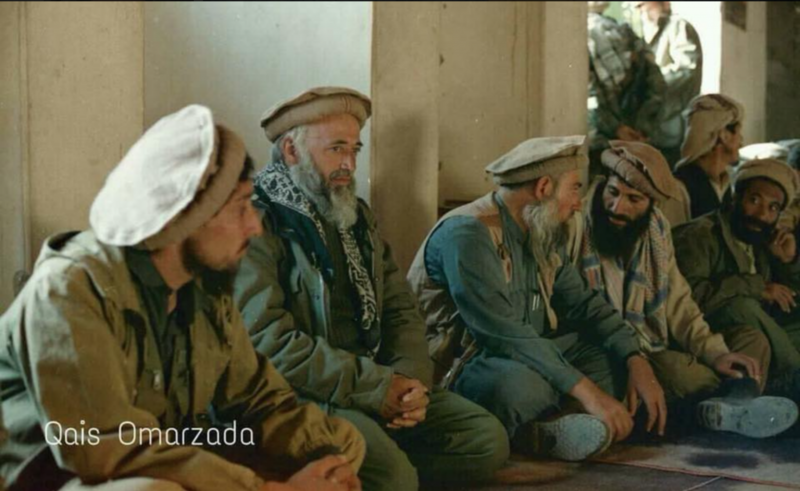 What becomes immediately clear in the extract is that Abdullah Azzam dedicates much time in the interview to Massoud. He clearly considers him an example of an idealised Mujahid and an expert in guerrilla warfare. A note on extract, some of the explanatory notes in [italics] are my notes and is separate from the original text. We arrived at Abro village, Farkhar during the middle of the night. The Mujahideen were accompanied by Commander Muhammed Siddiq Jikri and Dr. Najib president of the political council, and Abdullah Anas. The village itself did not exceed no more than ten families and we would spend the night in the house of Ahmed Shah Massoud’s trusted body guard, Taj al-Din, of eight years and keeper of his military plans. “My Name is ‘Ahmed Shah’ as for the word ‘Massoud’ I added that during my exile in Peshawar during the days of Daud [ Sardar Muhammad Daud, former President who deposed the Afghan King in 1973 with Marxist support and cracked down on the opposition] all of us had to choose a false identity and so I chose Massoud. From that day they added ‘Massoud’ to Ahmed Shah. As for my father his name is Dilwar Dost Mohammed and he is eighty seven years old and is known for his righteousness. From his earliest youth he was known for being attentive to his night prayers and Friday prayers. He is still alive. As for my mother she passed away during the days of Daud, I had left for Panshir during the days when Daud was hunting us. When I returned to my house I found my whole family except her and I realised that she had died. [Azzam] In fact, I have seen it myself. The village is completely destroyed. At the entrance to the village and its neighbouring village (Malasaba) I saw around three hundred destroyed tanks and military equipment. It is also known that Commander Muslim [one of Massoud’s commanders] is from the same village as Ahmed Shah Massoud. “The village Janklik [said Massoud] is considered the most communist of all the villages. God wrote that this very village would be the epicentre of Communism. Only my family alongside three other families adhered to Islam. As for the rest of them they were proud Communists. And from this town many leaders of the devils and preachers of infidelity came forth. Amongst them: Yunus Akbari, he had a PhD in nuclear physics and was a lecturer at the university of Kabul. He had the red certificate- this certificate is not awarded to anyone but the greatest Communist. And alongside Yunus there were his brothers one had a MA from Russia, the fourth brother had a PhD from Britain. There were others from the village Jal Muhammed, a lecturer in Communism in the army, his nick name in the army was Father of Communism, he was also a teacher in military cadet school, and most of the cadets were mentored by him. There was also Hadi Kareem, a graduate from the faculty of Islamic jurisprudence who became a Communist. He was imprisoned during the days of the King Zahir and later defected to Communism. He was offered the position of the Ministry of Justice by Najibullah [Muhammed Najibullah, 1947-1996, final president Republic of Afghanistan], but he refused. From Janklik around 64 famous Communists emerged and in the army around 60-70 Communist officers who graduated from the Soviet Union. There are other families with brigadiers and colonels from our village. Massoud told me: “ I urge you by God, not to add or clip anything from the picture that is in my mind,” and he began classify the members of the Islamic Movement according to their rank. “On the first level of the Islamic Movement were Professor Ghulam Muhammed Niyazi, Rabbani, Sayyaf, Rabbani Ateesh, Mawla Habib al-Rahman. On the second rank were prominent, distinguished and senior student leaders. Abdul al-Rahman Niyazi, Engineer Habib al-Rahman, Hekmatyar, Sayf al-Din and Nusrat Yar. [Azzam]: Then, Massoud changed subject and started talking about his strategy to fighting the Communists and the Russians. He brought out a map of Afghanistan and began talking about his plans from the time of the Communist coup [Saur Revolution April 1978] before the entry of the Soviets and went on to explain his current plans, and everyone was listening. I followed his extraordinary plans which had turned into a little school of Islamic guerrilla warfare. His immense experience had become complete and merited study, and one could benefit from the positive lessons whilst avoiding the negative. I believe that future generations will benefit from that too. [Azzam] I asked him if he had studied the lessons of guerrilla warfare such as that of Che Guevara, Mao Tse Tung and Ho Chi Min, Castro and others? He replied: “I have read all of these experiences during my Jihadi life and I continue to study and learn from these experiences.” Then he said, “But I have not benefited from books on organisation, tactics, strategies and phases as I have benefited from the the life of the Prophet. For I have studied deeply the life of Muhammed (Peace be Upon him) by Muhammed Huseyn Heikal (a celebrated Egyptian author and journalist) and learnt much from it. So I asked him have you studied the biography of Ibn Hisham [the earliest biography of the Prophet Muhammed] in depth? He replied that he had not. So I advised him to study it well.